“There But For Fortune” by Phil Ochs is the Peace Song of the Day for November 1, 2011. Yes…I am posting this the next day, because I was recalcitrant and did not post yesterday! You can find this song on page 186 of the Rise Up Singing songbook. This song is dedicated to the community at Liberty Square, who are dealing with an influx of homeless people and other people from the community who need support. This will be a trying time for Occupy Wall Street. Hope they will handle it with compassion and grace. Occupy Wall Street is going into its fourth week. 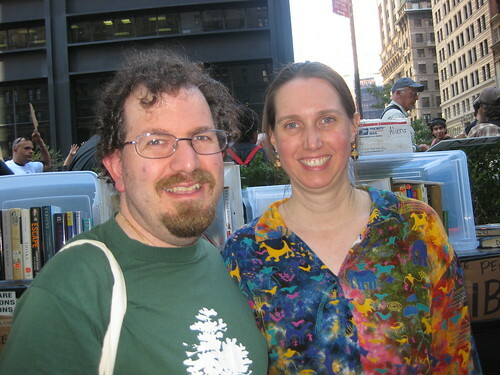 Kimberly and Ian Wilder of Peace Couple went to support the occupation today. They brought donations and their handheld camera. Hope you enjoy seeing some of the energy and spirit of this people’s movement to create more peace and justice in the world. 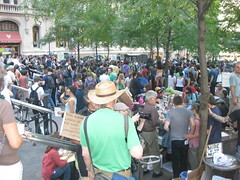 There is a link to our Peace Couple Occupy Wall Street photo album: here.